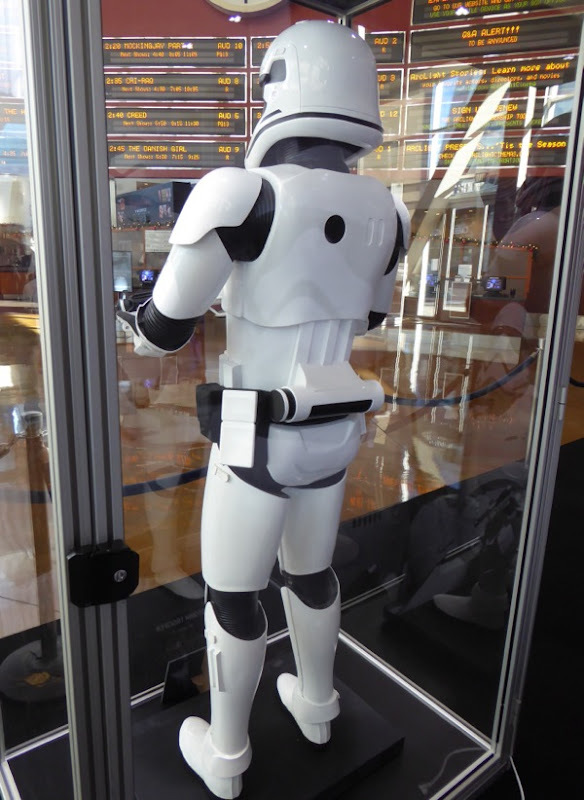 After last night's World Premiere in Hollywood, the excitement is at fever pitch for the box office release of Star Wars: The Force Awakens. 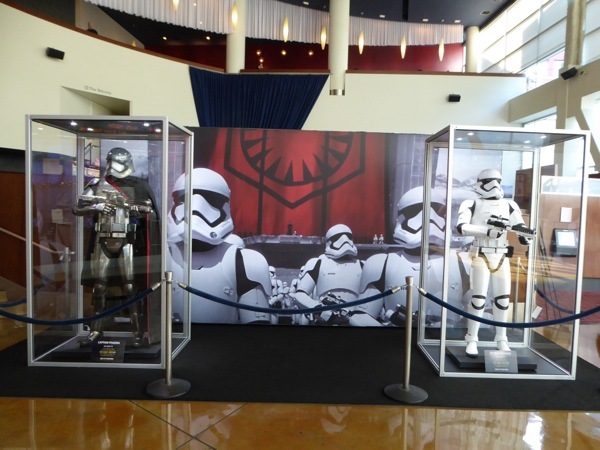 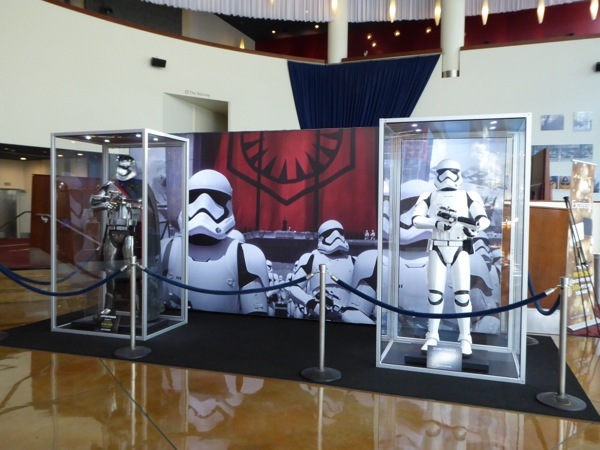 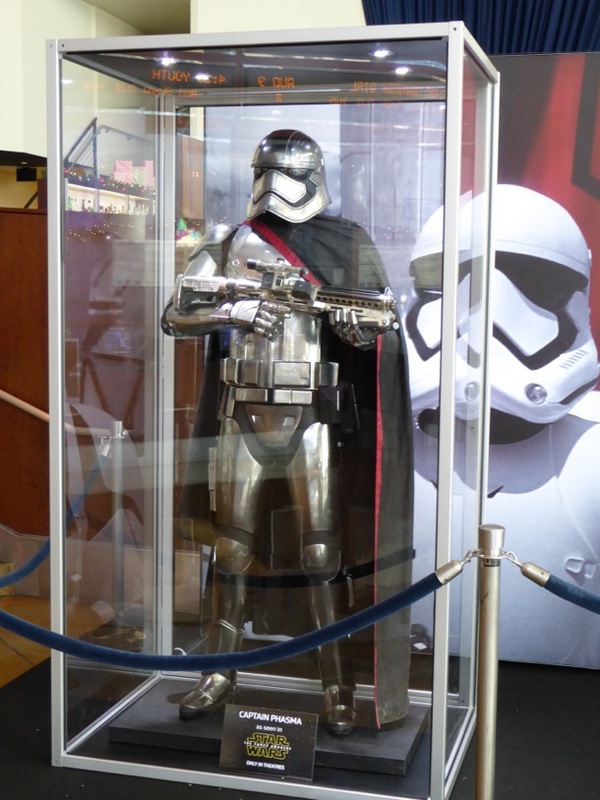 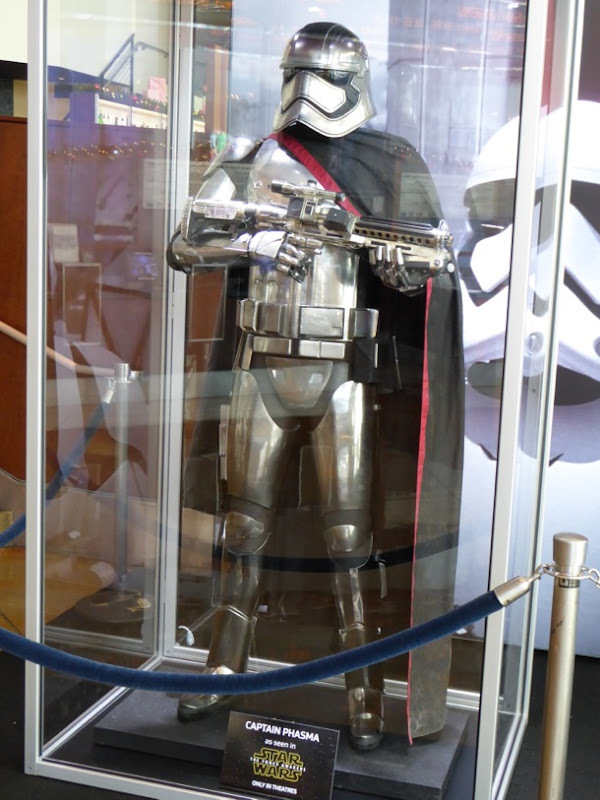 I have my tickets for Friday (and Sunday), but seeing these cool 'Captain Phasma' and First Order Stormtrooper costumes on display at ArcLight Hollywood today makes me want to see the movie now. 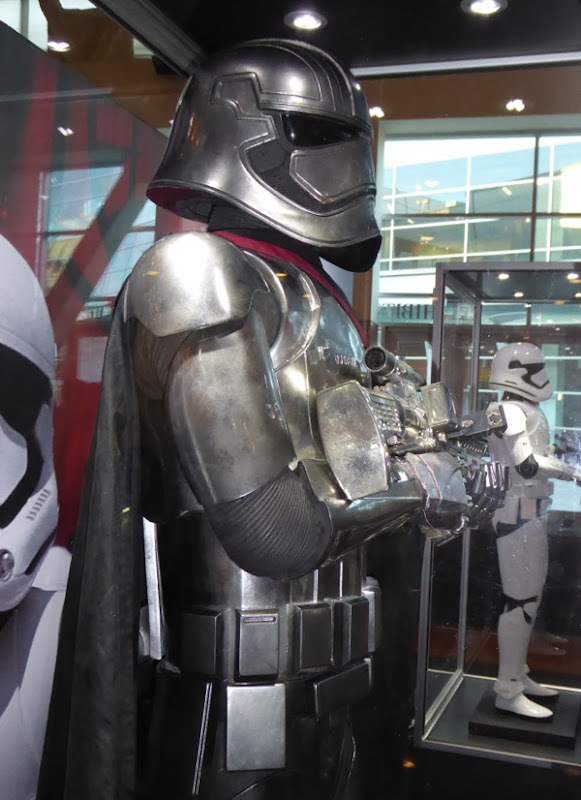 I've previously seen these costumes on display at this year's Disney D23 Expo out of their reflective display cases, but they were on raised platforms, so seeing them this close is a real treat and under this natural lighting you can also see the detail of the armour more. 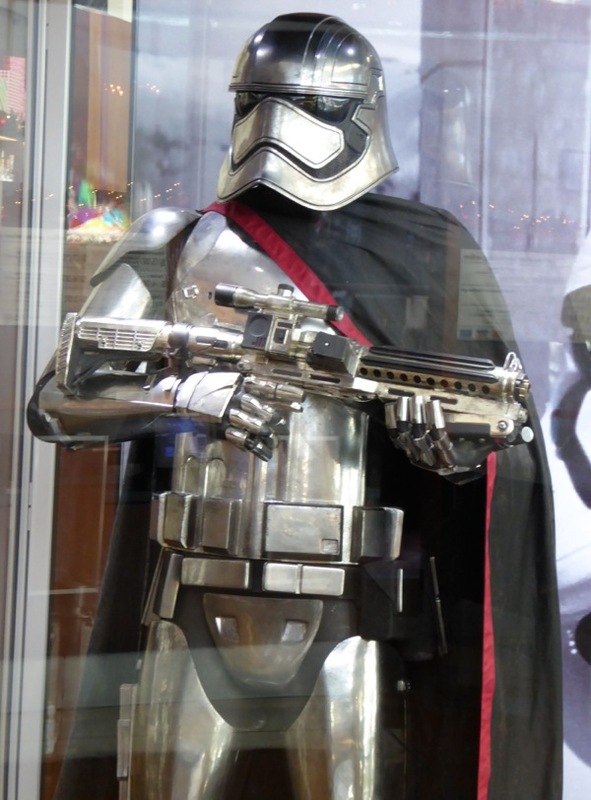 Michael Kaplan was charged with revamping the iconic look of Star Wars Stormtroopers and who'd have thought giving Gwendoline Christie's Captain Phasma armour a reflective chrome sheen and cape would make it the classic design look so exciting and menacing. 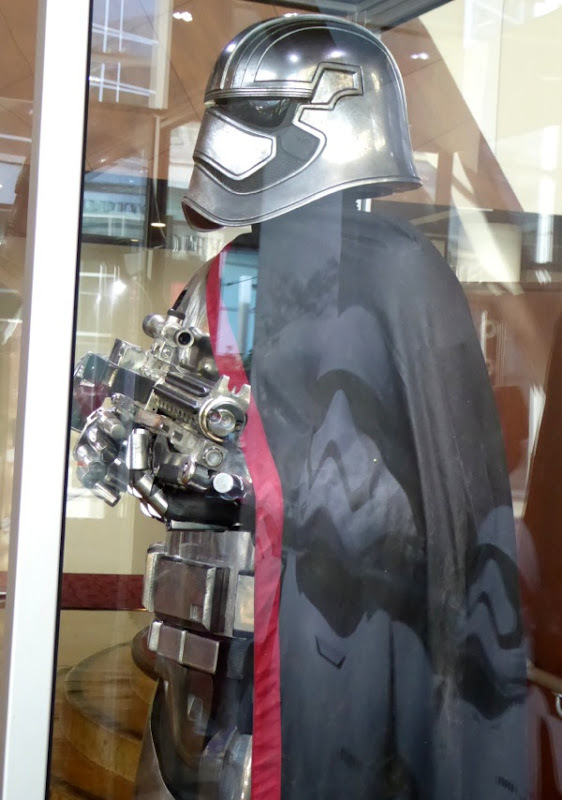 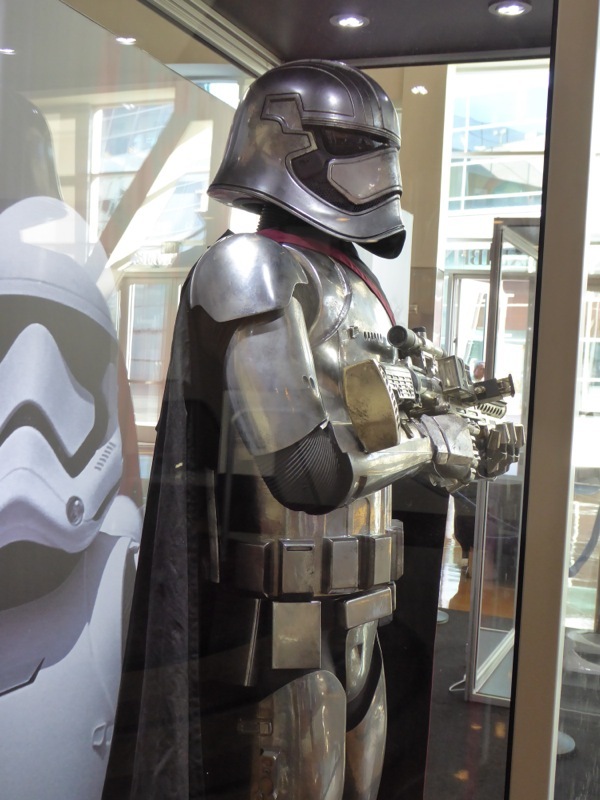 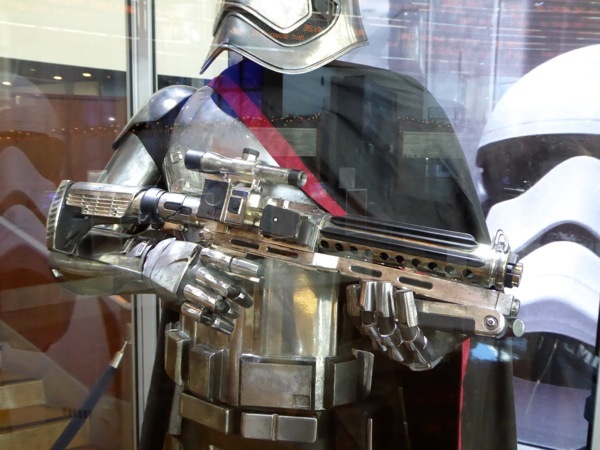 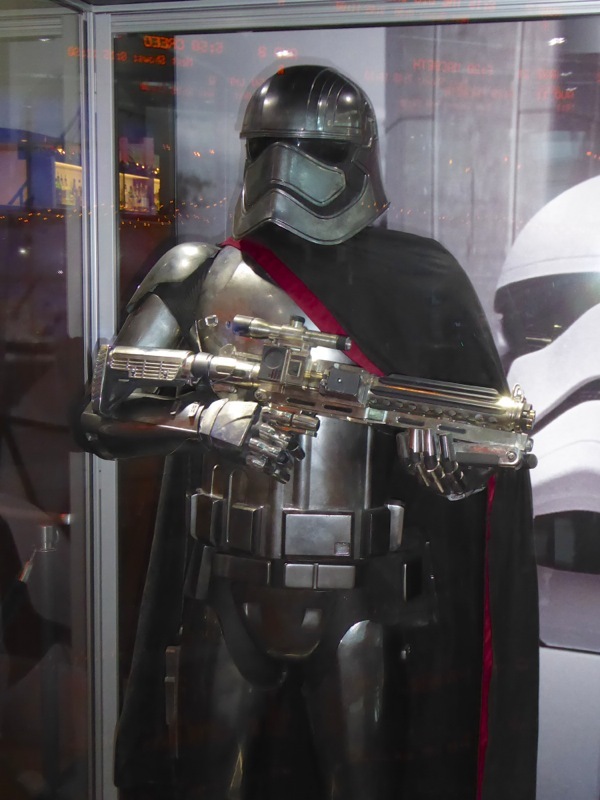 In addition to seeing this costume at ground level and in different lighting, this exhibit also sports Phasma's blaster, which I'm sure fans will love seeing. 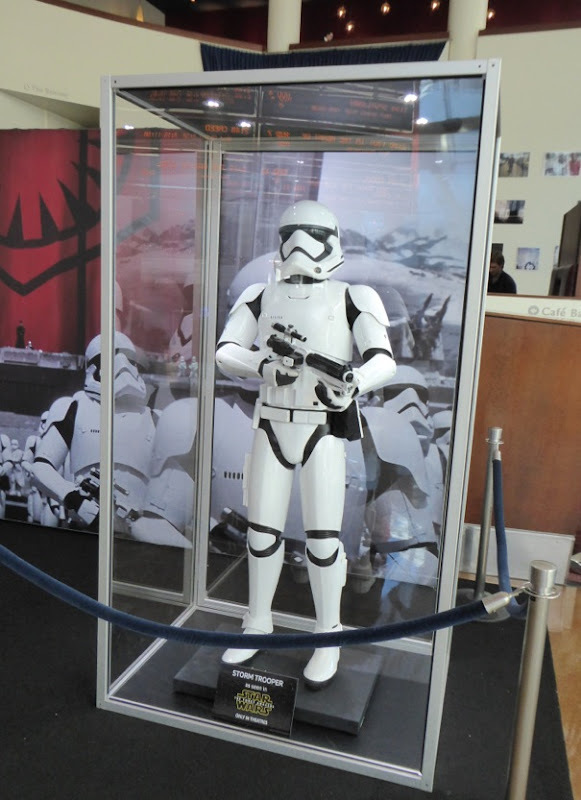 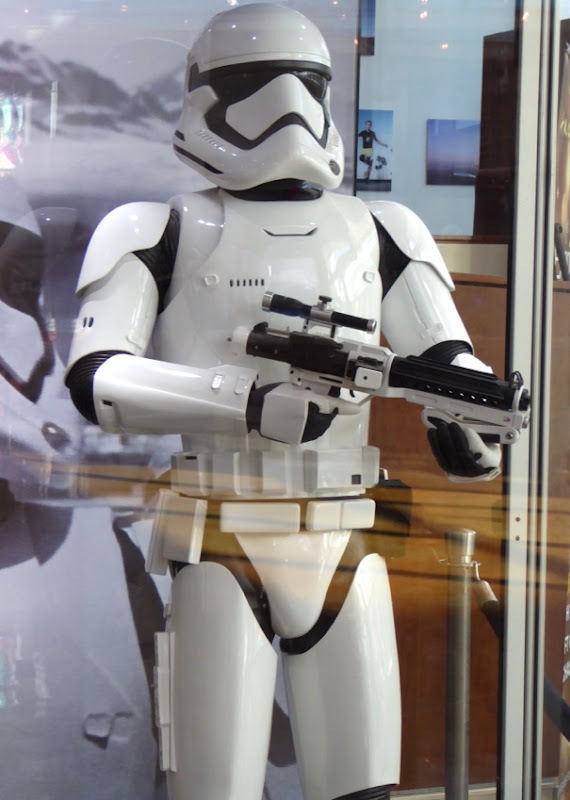 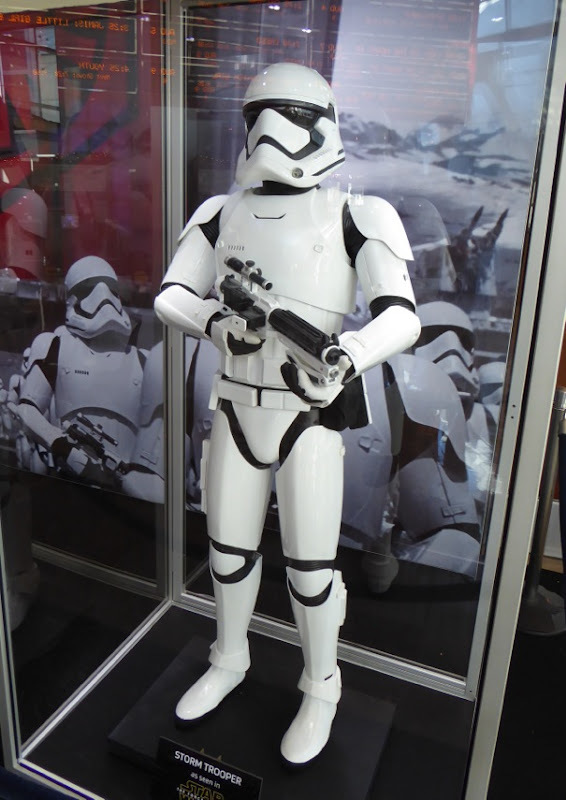 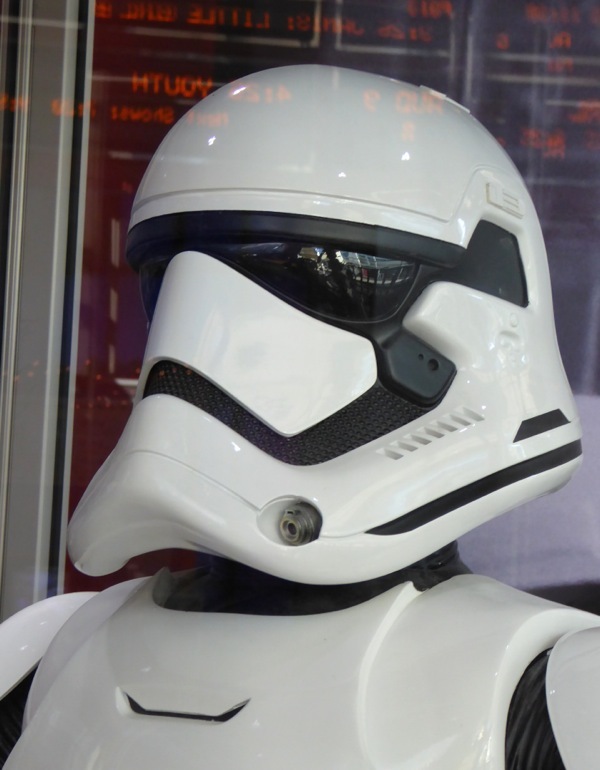 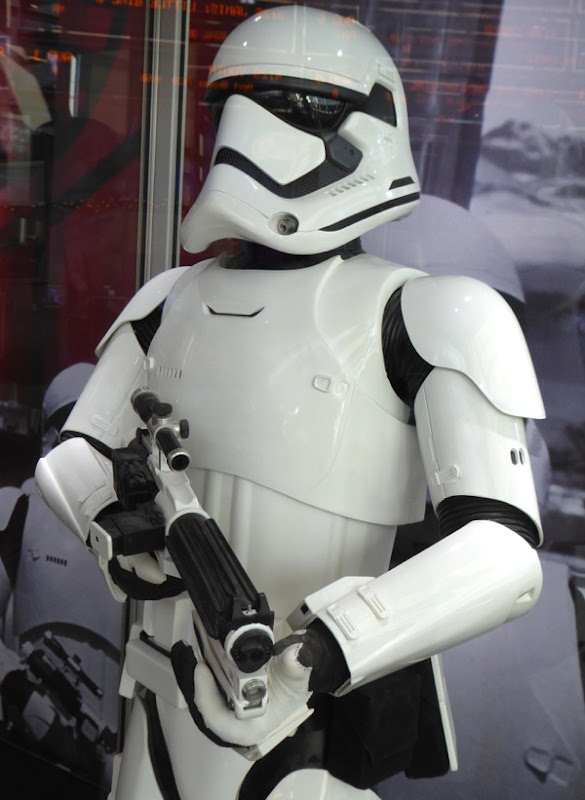 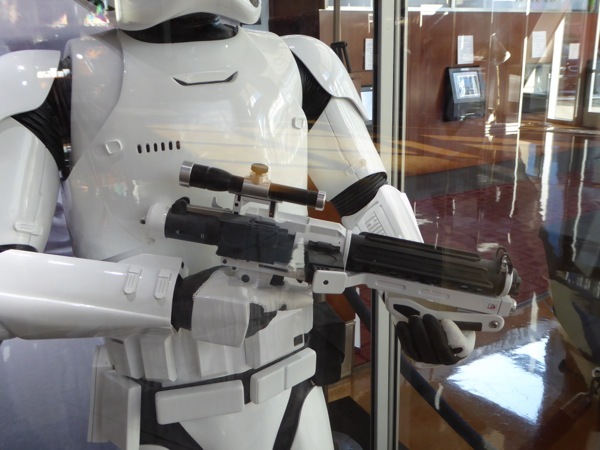 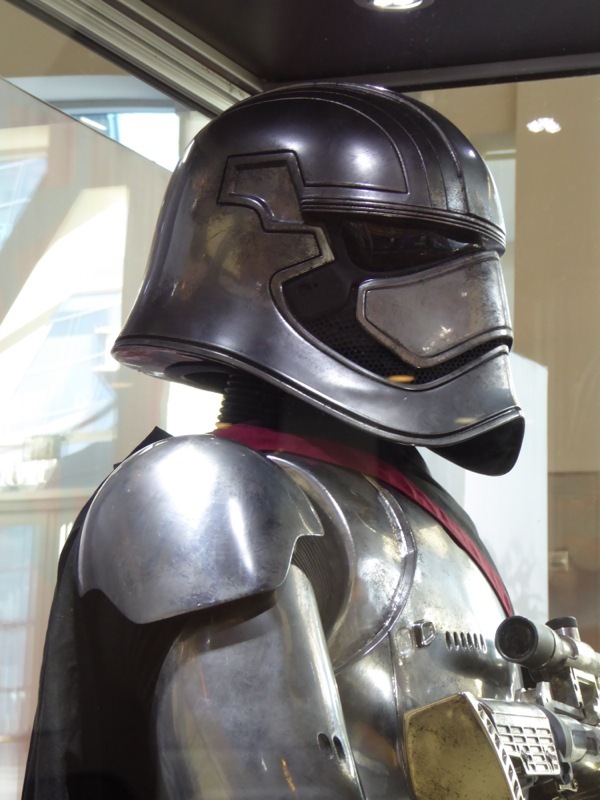 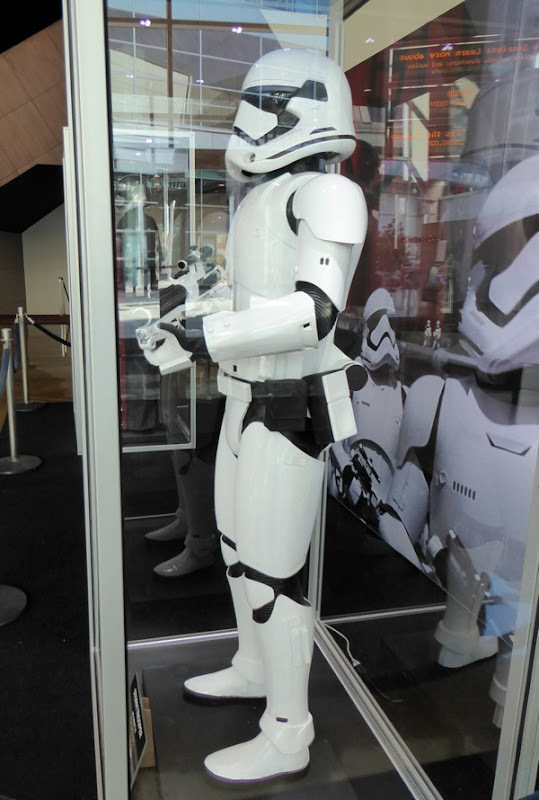 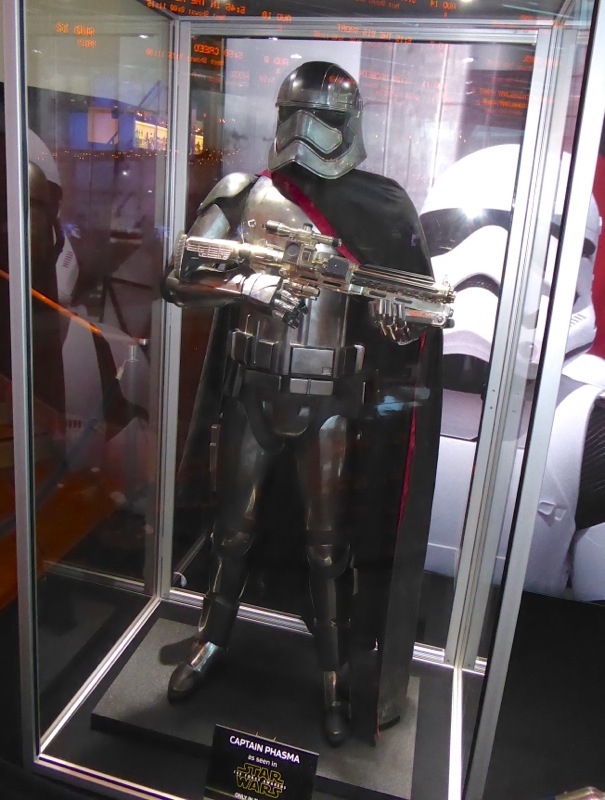 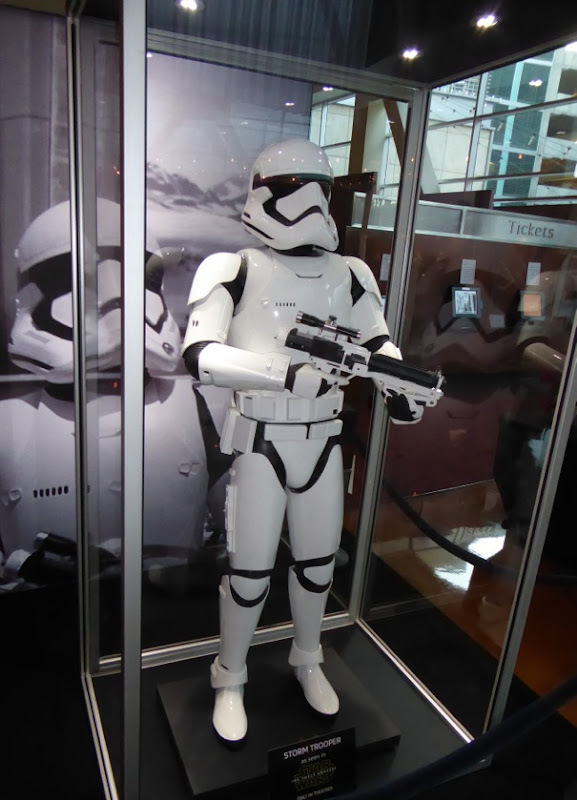 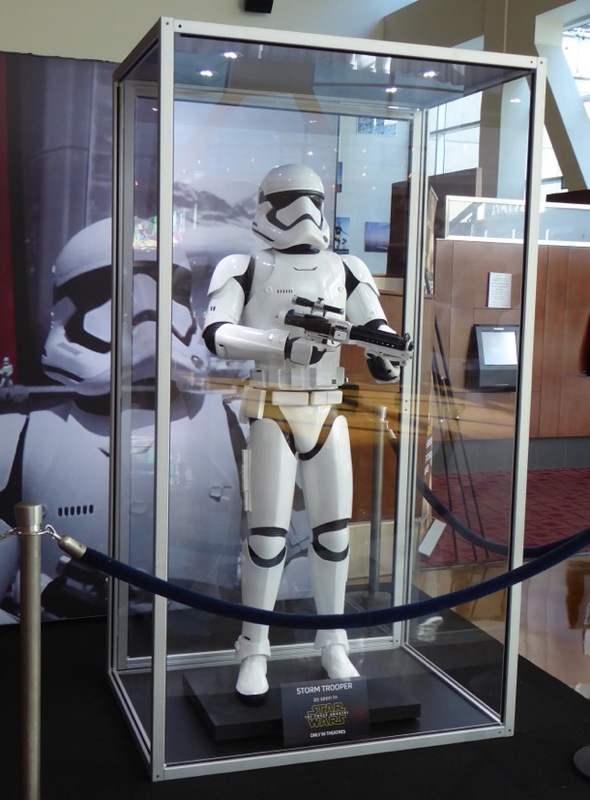 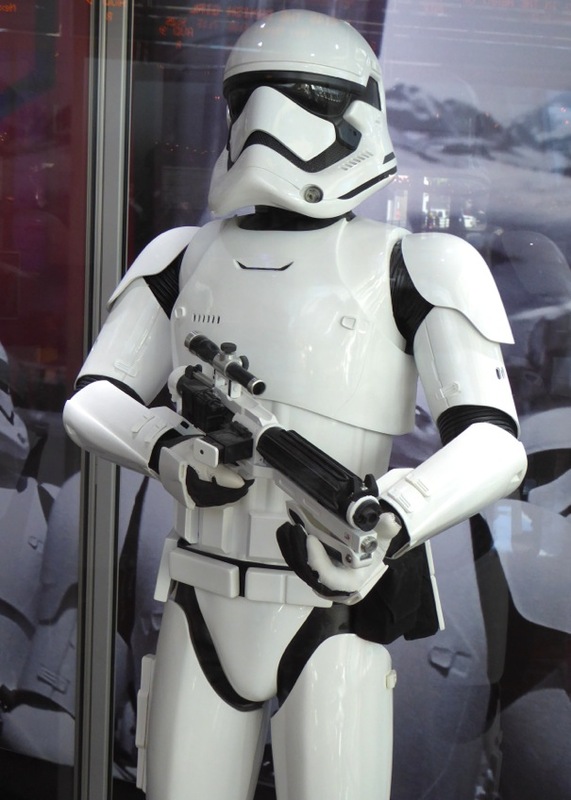 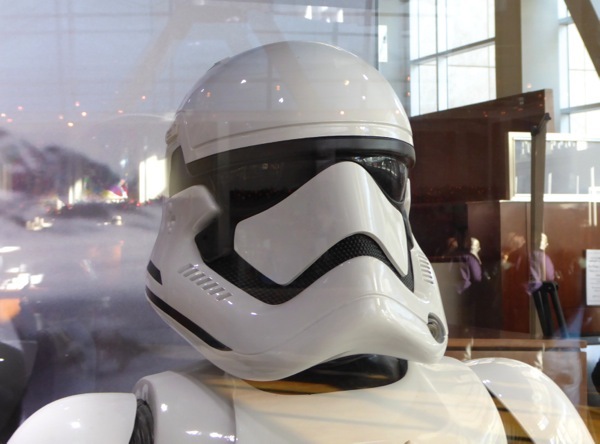 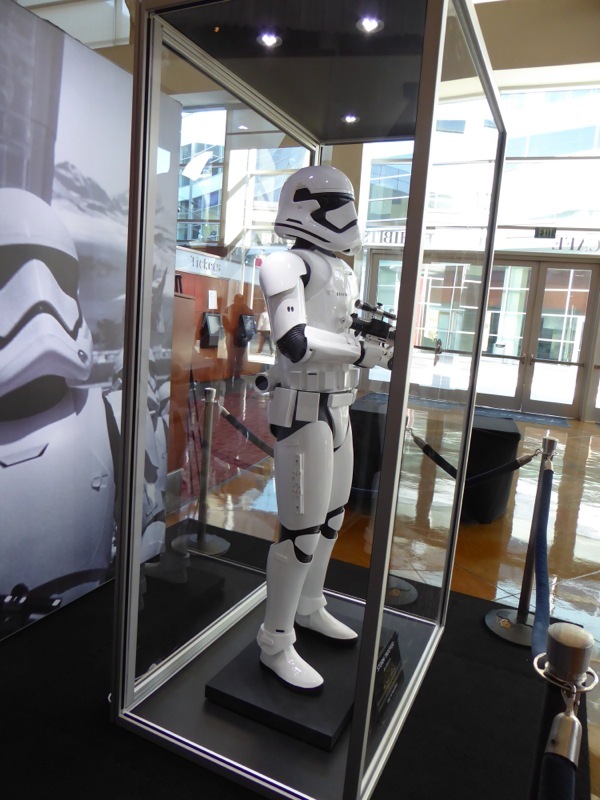 Meanwhile, there were probably hundreds of First Order Stormtrooper costumes manufactured for the new movie, but that doesn't make it any less cool to see up close and in person (and putting behind a display case makes it even more tantalising don't you think). 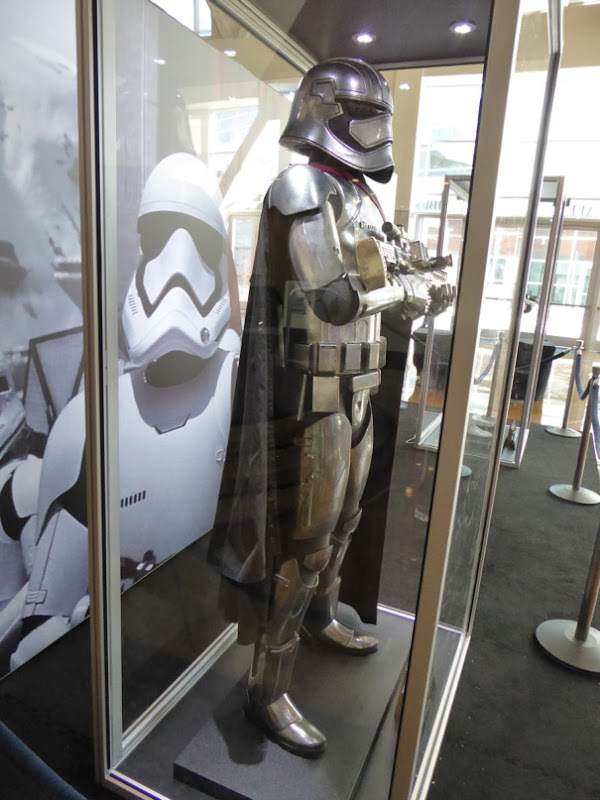 If you like these original film costumes, be sure to also check out Rey and Finn's hero costumes from Star Wars: The Force Awakens on display at D23 too. 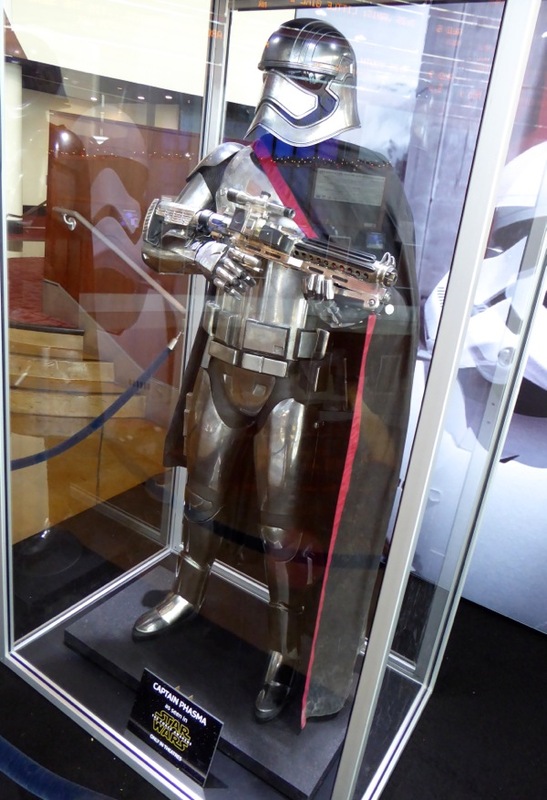 Not long now. 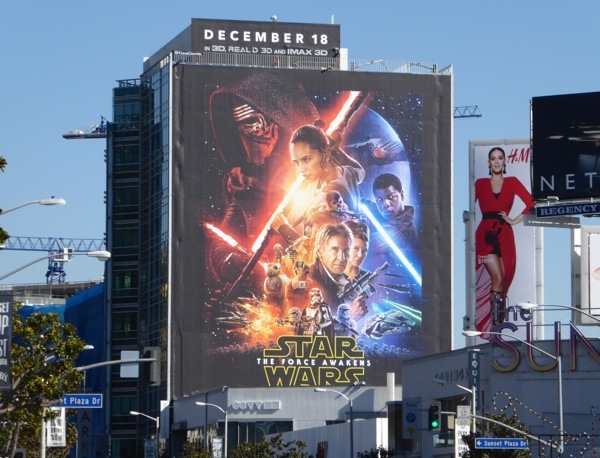 May the Force be with us all and please, no spoilers.